To Cite: Faghihi Langroudi T, Arjmand Shabestari A, Pourghorban R, Khalili Pouya E. Congenital External Carotid-External Jugular Arteriovenous Fistula: Diagnosis with Contrast-Enhanced Computed Tomography, Iran J Radiol. 2015 ; 12(1):e7450. doi: 10.5812/iranjradiol.7450. Arteriovenous fistula (AVF) between the external carotid artery and external jugular vein is extremely rare, with only few cases reported in the literature so far. Most of these AVFs have been either iatrogenic or secondary to previous trauma. Herein, we report a 42-year-old woman with congenital AVF between the external carotid artery and external jugular vein, presenting with palpitation and dyspnea. The patient was suffering from mitral and tricuspid regurgitation. On physical examination, a thrill on the left side of the neck and an audible bruit over the left mandibular angle were detected. The possibility of abnormal AVF was considered and it was confirmed on contrast-enhanced computed tomography (CT), inferring that this modality is not only fast and non-invasive, but also accurate in detecting vascular abnormalities. Arteriovenous fistulas (AVFs) are quite rare in the head and neck region and most of them are acquired, resulting from blunt or penetrating trauma. To the best of our knowledge, only 21 cases of congenital external carotid-external jugular AVF have been reported in the literature (1). Nowadays, with the advent of computed tomography (CT), it has become an integral part of evaluation in a wide spectrum of vascular diseases and among them AVF can be confidently diagnosed on obtained state-of-the-art images. We report a rare case of congenital external carotid-external jugular AVF with its characteristic imaging features on contrast-enhanced CT in an adult patient who was referred for the assessment of cardiac valvular disease. A 42-year-old woman presented with exacerbations of palpitation and dyspnea that she had been suffering from since her childhood. She had no history of trauma. Upon admission, the patient’s blood pressure was normal and an apical systolic murmur was heard during cardiac auscultation. Also detected was a thrill at the left side of the neck and an audible bruit over the left mandibular angle. Electrocardiography showed evidence of left ventricular hypertrophy and the chest X-ray revealed mild cardiac enlargement. Transesophageal echocardiography (TEE) demonstrated severe left ventricular enlargement, mild right ventricular enlargement, severe mitral regurgitation, moderate tricuspid regurgitation and moderate pulmonary hypertension. The cardiac ejection fraction was approximately 55%. With respect to chronic symptoms, attributable to valvular problems, mitral valve replacement was planned. Furthermore, abnormally dilated vascular structures with turbulent flow on the left side of the neck were also visualized on TEE. Presence of bruit in the physical exam as well as echocardiographic findings raised strong suspicion of AVF; therefore, the patient underwent CT-angiography of the cervical vasculature. Consequently, an AVF was identified between the distal part of the left external carotid artery and the left external jugular vein. Significant dilatation of the left common carotid artery, 20 mm in diameter, and the left external carotid artery were seen, accompanied by dilatation and tortuosity of the left external jugular vein; however, the major branches of the left external carotid artery had normal size and appearance (Figure 1). An incidental finding was made of hypoplasia of the mid and distal portions of the ipsilateral internal jugular vein. Thereafter, the patient was scheduled for ligation of the external carotid-external jugular AVF before mitral valve replacement. Figure 1. A 42-year-old woman with external carotid-external jugular AVF. 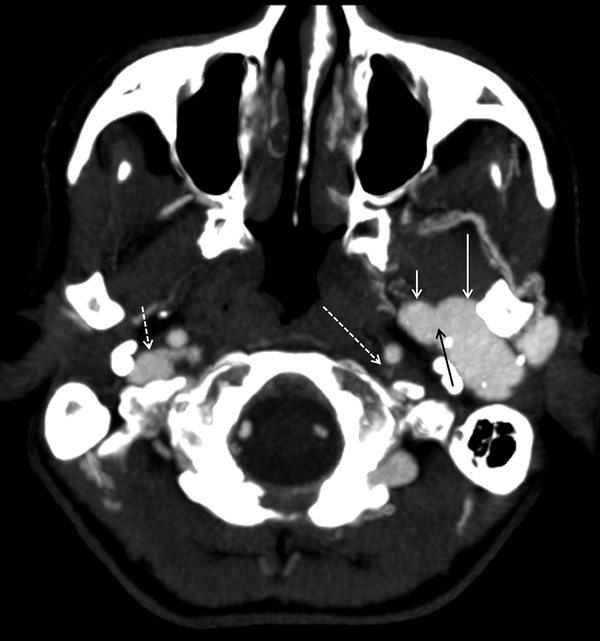 Axial contrast-enhanced CT shows the fistula (black arrow) between the left external carotid artery (short white arrow) and the left external jugular vein (long white arrow) with associated dilatation of these vessels. The left internal jugular vein (long dashed arrow) is incidentally hypoplastic, as compared with the normal right internal jugular vein (short dashed arrow). As a definition, any direct communication between an artery and a vein is defined as AVF. At first, the artery may have an increased number of abnormal branches and it may become dilated. In addition, it is commonly seen that the major draining vein is widely dilated, and it may become tortuous in appearance. AVFs of the head and neck are quite rare (1). Most cases are iatrogenic or secondary to penetrating trauma. Congenital AVF formation, neoplasms and degenerative vascular disease are among other etiologies of this entity. Furthermore, generalized connective tissue disorders, e.g. Ehlers-Danlos syndrome or type I neurofibromatosis, have also been associated with spontaneous AVF (2, 3). The symptoms of carotid AVF depend on the severity of the shunt. The most common symptoms are a pulsatile mass, swelling, and pain and untreated fistula may lead to cardiac failure, fistula rupture, or emboli (4-7). In the literature, three patients with AVF between the external carotid artery and the external jugular vein presented with vertigo (8). Our patient; however, had no neurological symptoms and no evidence of cardiac failure had developed yet. Diagnosis of AVF is usually not difficult, but the vessels involved should be precisely identified. CT-angiography has been shown to be a robust noninvasive alternative to conventional angiography for the initial assessment of vascular anomalies and it markedly enhances the diagnostic accuracy in AVFs. Furthermore, with the advent of multi-detector row CT and three-dimensional post processing, vascular abnormalities can be more accurately depicted after a single intravenous bolus of contrast agent administration (Figure 2). 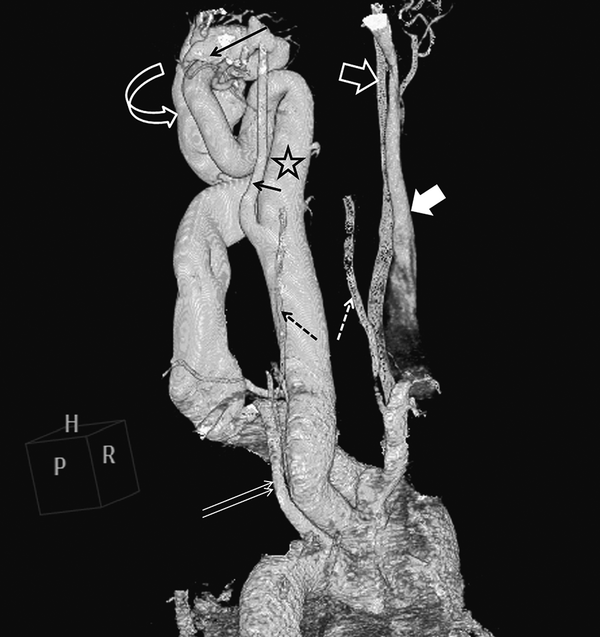 A delicate CT-angiography of the surrounding anatomy and vascular structures yields more detailed information about the feeding arterial supply, vascular drainage, collateral circulation, and possible fistula-unrelated vascular malformations; thus, it provides a road map for the possible surgical procedures (9). CT-angiography of our patient showed AVF between the left external carotid and the external jugular vein associated with significant dilatation and tortuosity of these vessels. The mentioned fistula was confidently diagnosed with the use of CT-angiography, and it was also confirmed after open surgery of the neck. Figure 2. Volume-rendering three-dimensional reconstruction CT image, oblique posterior view, demonstrates the fistula (long black arrow) between the left external carotid artery (star) and the left external jugular vein (curved arrow). Also depicted is the overall view of the cervical vessels, including the left (small black arrow) and right (white open arrow) internal carotid artery, the right internal jugular vein (white solid arrow), the left subclavian artery (double white arrow), and the right (white dashed arrow) and left (black dashed arrow) vertebral arteries.